I remember vividly a toy I had at a young age. It was a sort of rectangular wooden box and at the top were holes in different shapes with a different colored border for each one. 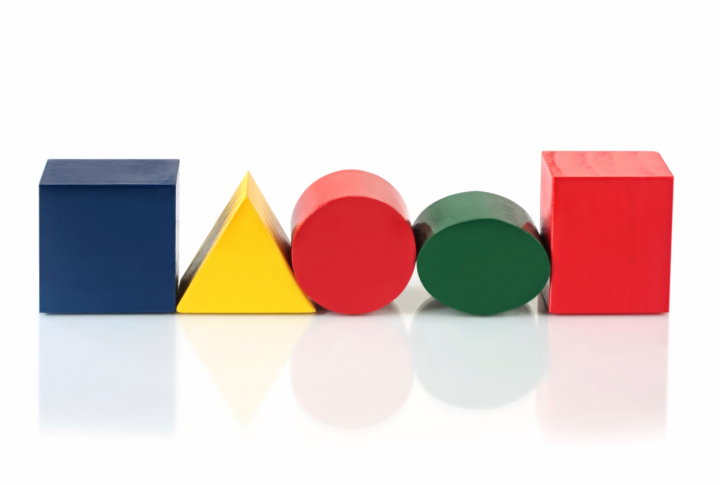 These shapes corresponded with blocks: a red circle, a blue square, a yellow triangle. I remember the utter futility and frustration of trying to make a triangle block fit into the square or the circle into the triangle opening. And I also remember the feeling of complete success, of momentous satisfaction when I slid the block into the right shape and heard the clunk of the block hitting the inside of the box. Such a simple toy. Such a simple action. Such a complicated process of learning and development to get there. I spent yesterday with two beings who are just over a year old. They were a sheer delight to be around. They ate their food when they were hungry and drank water when they were thirsty. They handed books to adults when they wanted to be read to. They reached out to be held. They played on musical toys. When they were amused or happy, they smiled or filled the room with laughter. When they fell or banged a limb or got tired, they cried. They squawked when they were annoyed or didn’t want to share. Because they are so new to the world, because they are so early in their development, there is no voice telling them who they are supposed to be. They simply are. And this, their being and their becoming, is a beautiful thing witness. As adults, it is harder to accept that we just are. We find it much more challenging to appreciate our own being and becoming. I made myself a schedule for this month, full of hourly to-dos and work plans. Sometimes when I have looked at it, I have felt empowered or disciplined. There have been occasions when I have followed it to a t. Most times when I have looked at it though, I have felt a sense of impending doom. Because after teaching steadily through the year and then two intensive summer sessions in June, I am exhausted. So my aspirations, even those that feel exciting to me, begin to cull. They accumulate as demands until I feel as if I am commandeering my own life rather than committing to myself and my passions. The line between commandeering and committing feels very thin sometimes. I think one of the most dangerous myths of our culture is the ultimate primacy given to productivity. We are taught to believe that if we aren’t constantly doing, if we aren’t always moving or busy, we are not earning our keep on the planet. We learn to count hours and output. We are trained in crunching numbers. We are encouraged to calculate the meaning of our lives based on the quantities in them: how many things we check off our to-do list per day, how much money is in our banking account, how many phone calls we made, how many many emails we sent, how many likes our status update got, how many tasks we completed at once, how many dishes done. We read up on “time saving applications” not remembering that time can never be saved, only spent. In our efforts to provide measurements of our own worth, to ourselves and others, we commandeer the time we are given. And in doing so, we miss all the subtleties. We miss the small shifts in our own ways of thinking. We miss tiny moments. We forget to glance up at the sky when we get out of our cars. We pass by strangers walking their dogs at the park without stopping to say hello. We forget to breathe in and remember how much we enjoy the smell of creosote just before it rains. We have no time to sit still. We have no time to look at the moon. I’m sure we all have moments when we are fully present, but I’m also sure we all have moments when we try to control every aspect of our experience. There is a difference between using the focused attention required to fit a circular object into a circular space and trying to jam a triangle shape into a square opening because we have decided we will make it fit. Hungarian psychology professor Mihály Csíkszentmihályi developed and researched the theory of “flow.” Flow is a mental state wherein a person doing an activity is fully absorbed in the activity to the extent that they experience a feeling of complete focus, engagement, and pleasure. They are completely immersed in what they are doing. Think of a writer writing, a cellist playing cello, a painter painting, a child engaging in the act of playing with her toys. Flow is not something that can be forced. We have to show up but we have to show up without demands and expectations beyond the offering of ourselves and this space and this time. The writer sits at her desk, the cellist picks up his instrument, the painter holds his brush, the child sits on the floor with her toys. Flow requires attention but it also requires a kind of letting go. On the opposite side of the spectrum, commandeering comes out of a belief that we can control our lives in a way that will provide satisfaction, prove our own merits, and protect us from harm and suffering. Commandeering, at least in this context, seems to be motivated primarily by fear. Freely chosen discipline corrects the sometimes-antagonistic aspect of the word “discipline” by adding the concepts of “choice” and “freedom.” Freely chosen discipline seems to hold space for both accountability and flexibility. We plan a schedule for ourselves and when life happens, we adapt and change while still committing to our goals. This allows time for us to move towards what we want to accomplish while not defining ourselves by what we do or make. We can choose when we work, when we play, when we do, and when we simply are. Thanks! Particularly loved this today. Thanks so much, Maureen. For reading and for your kind words.